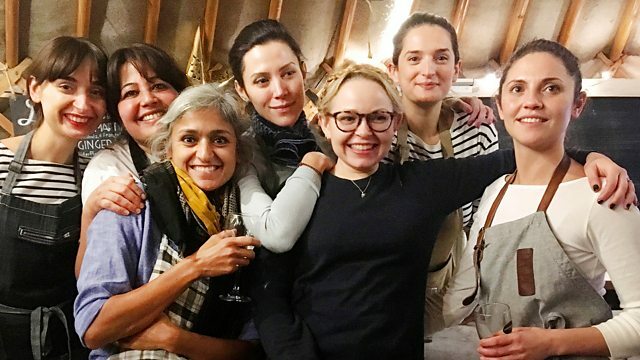 Olia Hercules, Romy Gill, Xanthe Clay and Elly Curshen are among ten women from different food cultures coming together for the first time to cook a truly female feast. 'Pop-up' chef and food writer Olia Hercules, The Great British Bake Off contestant turned Youtube star Chetna Makan, Film academic come supper club hostess Dr Alissa Timoshkina and cafe chef / 'instagrammer' / writer Elly Curshen are among ten women from different food cultures coming together for the first time to cook a truly female feast. It's a 'pop-up' dinner hosted and put together in Bristol by Romy Gill and Kim Somauroo to raise money for international charity 'Action Against Hunger'. Sheila Dillon speaks to the 'Severn Sisters' as well as their guests, including former BBC Food & Farming Awards winning Shauna Guinn and Sam Evans, about what it means to be female in food in 2016. Also interviewed are Eleonora Galasso, Natasha Corrett, Rosie Birkett, Laura Field, Fiona Beckett and Xanthe Clay. ...well actually, there were 10 women cooking as part of the event.